MASS (GET) with beef liver and mushrooms. Washed, dried, chopped pieces of beef liver. Toasted in a shallow pan (frygetro) chopped onions and mushrooms for about 5 minutes at medium heat with the butter until the onions acquire golden brown color. Removed mushrooms and onions and comminuted liver added and toasted and this for about 5 minutes until completely lost the reddish color in its interior.The materials are placed together in deep powderevos added and the mixture of Archestratus and plum wine. The mixture was stirred and if too thick add 1 or 2 tablespoons butter goat.Placed in individual utensils (molds) and served after cooling to ambient temperature. Tip: At the end pour the mixture into the pan with the liver and mushrooms then delete them with wine and fill with butter and stir briefly served. 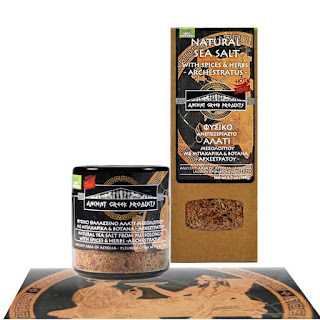 Try this ancient mixture Mesolonghi salt, herbs and spices to roast veal or beef liver, and in steak, cooked in chicken meat hunting and salads. 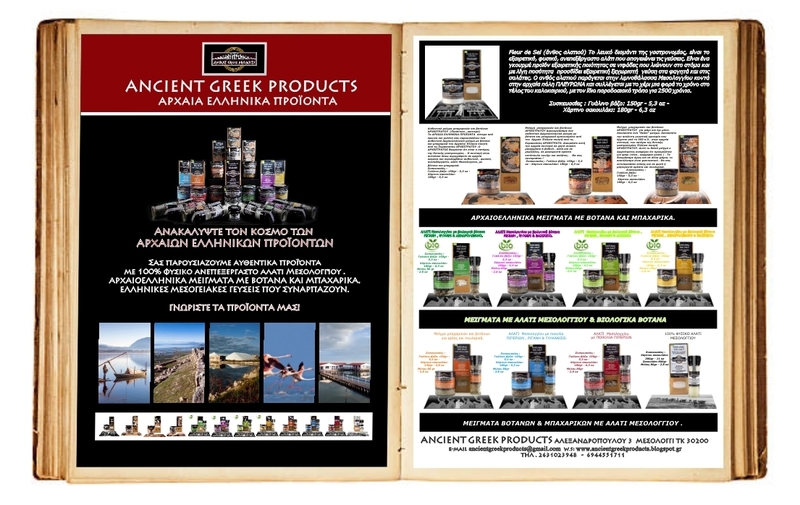 Let your imagination to create ancient Greek recipes and travel to the flavors of ancient Greece. Will fascinate you! 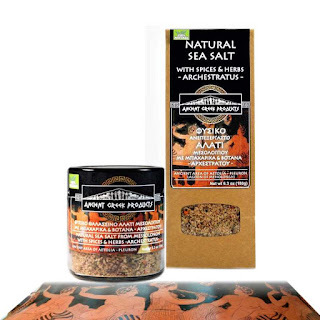 Mixture of spices and herbs Archestratus fish and more. 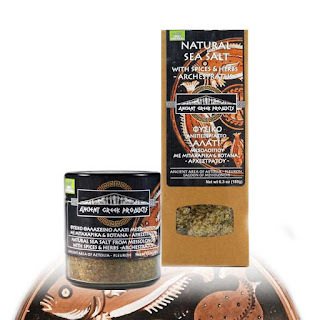 Ingredients : 4 Fish fillets 120 gr . 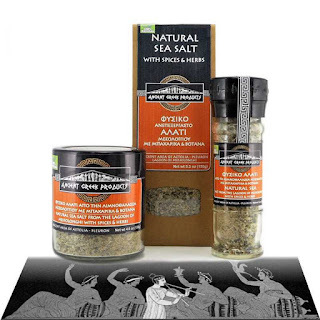 4 teaspoons Mixture of spices and herbs Archestratus fish and more. 3 teaspoons Olive oil. 45ml Red wine vinegar. 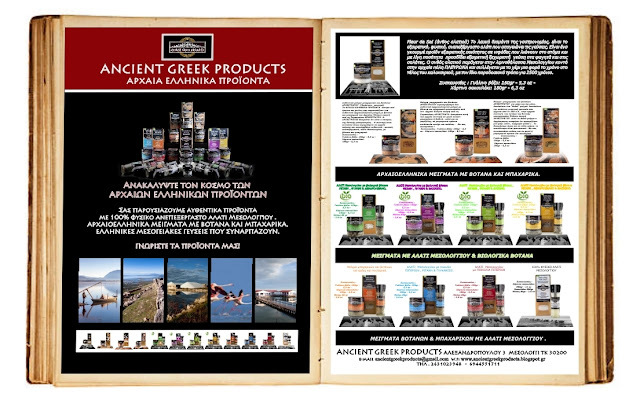 Implementation Archestratos put olive oil on the fillets of fish. Put a little of the mixture on each side of the fillets and fry in olive oil for 6-8 minutes on each side until they become golden brown in color. Serve it with green salad with a tablespoon of olive oil, a tablespoon of red wine vinegar and a small amount of garou. In Toroni you must buy shark fillets. Sprinkle them with the cumin and some salt, it does not need to add anything more except maybe some olive oil: when they are ready you will serve chopped salad for garnish and the fillets. As You will cook all these fillets, plenty for your pan, do not throw in water or vinegar, but only pour with oil, cumin dry and herbs. Roast them on coals and not high heat and turn them around frequently in order not to burn. 1.5 kg chicken ready to cook (cut into pieces). Preheat the oven to 180°C. Over a medium heat, warm the olive oil in a large, heavy based frying pan then place the chicken pieces in and leave for 4-5 minutes until they are golden brown. Place the chicken in an oven proof dish. Then mix the lemon juice and water with the crushed garlic, lemon zest, ground black pepper and ANCIENT GREEK PRODUCTS MIX and pour over the chicken. Bake the chicken, covered in the sauce for 45-50 minutes until tender, basting every 15 minutes. When cooked, place the chicken on a warm platter, pour the sauce over it and serve with rice or potatoes and vegetables of your choice. Documentary : The Journey of Food.